Every e-Commerce operator who is required to collect taxes at source (TCS) for all the taxable supplies made through it, must file GSTR 8. The details of such taxable supplies and the tax collected at source by the e-commerce operator need to be reported in the GSTR-8 form. The return in Form GSTR-8 needs to be filed on the GST Portal by 10th of the next month. 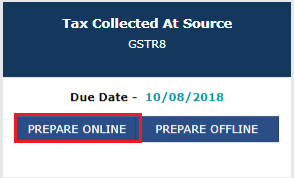 Step-4: Click on “PREPARE ONLINE” appearing below GSTR-8 in the dialogue box. Tile 3 – Here the details of Tax collected at source (TCS) related to the current month is required to be disclosed. Tile 4 – This option can be used to amend the details relating to the earlier period. Since the GSTR-8 for the month of October 2018 is the first return, there would be no amendments in the first month. Tile 5 – To view the details of the interest payable for delay in payment of taxes collected to the government. 1. Enter following details in the tile 3 “Details of Supplies attracting TCS” & Click on ‘Save’. Enter the amount collected at source under IGST/ CGST/ SGST heads. 2. Enter the correct details against erroneous entries uploaded for any of the previous months in Tile 4- “Amendment to details of Supplies attracting TCS”. Under this option, correction can be made in supplier-wise details related to the particular month and financial year which has been incorrectly uploaded by the e-commerce operator in the earlier period. Upon clicking the “Amend TCS Details”, option for correcting GSTIN of the vendor, values mentioned against registered vendors and unregistered vendors and TCS deducted against such supplies can be amended. Fill in the correct details, click on Save and return back to Amendment menu. Under this option, the details of transactions rejected/modified by Supplier will appear. We can edit the entry appearing on the screen based on such rejection/modification uploaded by supplier and fill in the corrected details. The screen will display the same options as in case of “Uploaded by E-Commerce Operator” with the values suggested by the Supplier. After entering the corrected data, click on Save and return back to Amendment menu. Step-6: Click on “Preview GSTR 8” once all the details have been uploaded. Then, verify the data uploaded and click on “Proceed to File”. 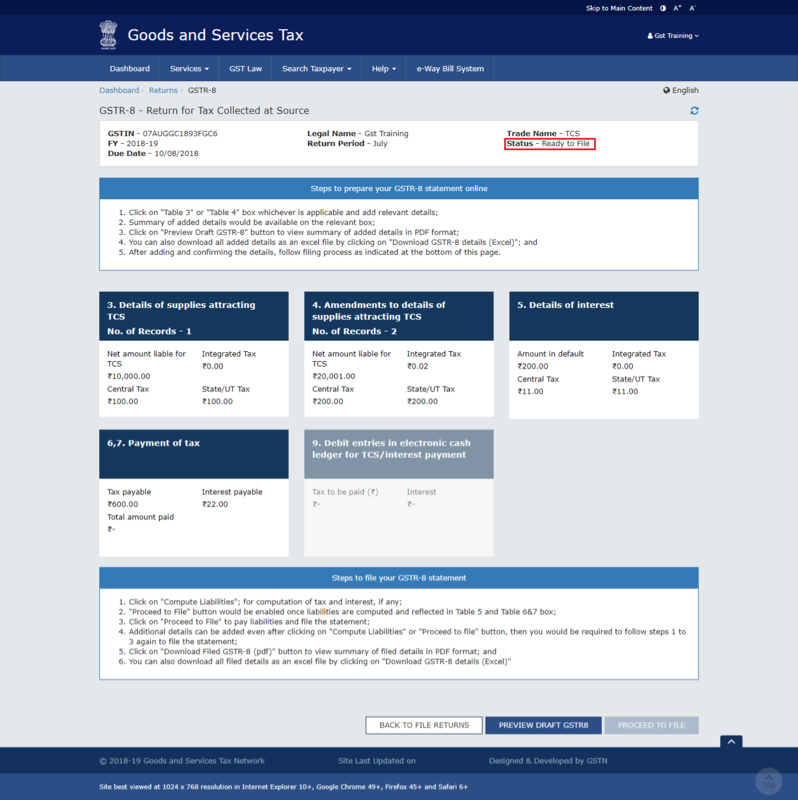 Step-7: Once the status of GSTR-8 is updated to “Ready to File”, this will enable tile 5 “Details of interest” and tile 6, 7 “Payment of Tax”. Step-8: View the interest on the delay in payment of the TCS liability, the filing of the TCS return, etc., under “Details of Interest” tile, if any. Step-10: Finally, one can preview the draft GSTR-8 and acknowledge the declaration for filing the GSTR-8. Then, click on “File GSTR 8”. Use Digital Signature Certificate (DSC) of the authorised signatory or Electronic Verification Code (EVC).